February 14 is a day set aside for the celebration of love; so, it’s a good day to send a greeting to all my dear friends and to tell this little story about how a cat named Galileo and I become best buddies. It’s sort of a love story and it has a happy ending. I was a sad little guy when the people I had been living with moved away leaving me all alone - hungry, sad, and scared. A nice lady started to give me food so I didn’t starve. But, because she had a dog, she couldn’t give me a home; so, on my behalf, she contacted the Animal Welfare Association (AWA). These kind people took me in and gave me a warm, safe place to stay and food to eat, and they promised me that, one day, I’d be adopted and have a really good “forever home.” I was well cared for by the staff at the Rockland Veterinary Hospital but I kept dreaming of the day when I’d be adopted – and would live in my own house with people who would love me, never, ever abandon me, and who’d make every day of the rest of my life something to purr about. I’d been waiting three months and I was getting very worried that these people would never come. I had been given one chance when a woman, who said she’d always wanted a fluffy white cat, had taken me home with her but then returned me, saying that I shed too much fur. I was scared I’d blown it and that no one would want me. Then, one afternoon, as I was curled up in my cage, two people arrived wanting to visit with a cat; I got excited but they walked by my cage, ignoring me, and stopped in front of the cage of another cat – a tabby. I knew instantly that these were “my people” and that I was the cat for them; so, I meowed and shoved my paws through the cage door to get their attention. Eventually, they walked back, looked at me and even patted my head but I heard them say that they didn’t want another white cat. And, sadly, I watched them leave. I was very sad all that week and through the weekend but, on Monday, I was taken to a glassed in room – the place where volunteers come to play with us little orphan cats. And in walked, not one of the nice volunteers I know, but these same people and this time they had come to see me. I was so excited that I jumped right into the arms of the man and snuggled into his beard. I heard him say those magic words: “I love you,” and these people told me exactly what I wanted to hear - that they’d be arranging to adopt me – and that I’d be going home with them. A couple of days later (on November 10, 2010), they picked me up and drove me “home.” It was a great big house and they took me upstairs to what they said was my very own room. It was a nice place – a library with lots of books, a cozy basket for a bed, a box with crinkly paper to play in, a carpeted staircase up to a perch where I could look out the window, my own litter box, food and water dishes, and the little crocheted catnip ball that had become my favorite toy. It was nice and my new mother and father spent lots of time in my room playing and cuddling with me. But there was one problem – there was another cat living in the house and, as they explained it to me, he was an older fellow (almost 17,) he owned the house, “he ruled the roost,” and, if I was ever to have the run of the house and be able to truly call this “home,” I needed to convince Galileo that he wanted me for a buddy. Galileo, as I discovered, was a white cat too and he looked, in fact, a lot like me. 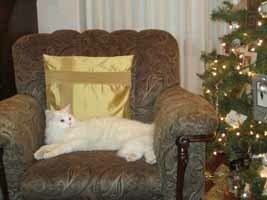 He had had a best friend, a beautiful girl cat (also white and fluffy) who had died just a few months ago. He had lived for almost 16 years with her; she, and only she, had won his heart. So, my job was to win his heart and to become his new best friend. I could see that my people were worried too as they loved Galileo but they reassured me that they loved me too and encouraged me to keep trying. So, I learned that it was best not to run after Galileo – or steal his food – or use his litter box – or startle him – or meow too loudly. I kept hoping that, if I was quiet and polite and didn’t bother him, he’d get to like me. In a few weeks, things got a bit better. Galileo gave the signal that it was OK with him if I was in the same room just so long as I didn’t get too close. Then, by mid December, he seemed happy to have me lounging on a chair while he sprawled out on a couch and he was starting to talk to me, to tell me how much he liked chewing on candy canes, how much fun it was to swat the ornaments on the tree, and how some guy named Santa would be bringing us presents all wrapped up in crinkly paper. I was out and about in the house pretty much all day but still spending the nights in my Library Room. By Christmas Day, Galileo had started to wait for me at the closed Library Room door each morning till I came out; then, we’d greet each other by rubbing noses and we’d race downstairs and play together. It was great fun. And I was very, very happy because I had a buddy AND I had a home AND I lived with a family who loved me. That’s how Galileo and I became the best of buddies and how I came to be living with my people in my very own house. I hope that all the cats rescued by the AWA folks find forever homes – and LOVE! I’m grateful to AWA for caring about me, looking after me and for making it possible for Galileo and me to find each other.